Fairbanks, Alaska (AK) - The 2017 Iditarod Trail Sled Dog Race, also known as "The Last Great Race," is now scheduled to run from Fairbanks to Nome, moving it closer to the original historic route. March 6, 2017 marks the third time in history the official start of the Iditarod will take place in Fairbanks. The Iditarod Trail Committee made the announcement after the trail conditions in the Alaska Mountain Range were judged to be unsafe. The Iditarod was inspired by “The Serum Run” of 1925 where heroic dogs and mushers became life savers in an incredible race against time. This legendary journey to deliver serum via dog team began just south of Fairbanks in the town of Nenana and ended 674 miles later in the small city of Nome which was facing a diphtheria outbreak. 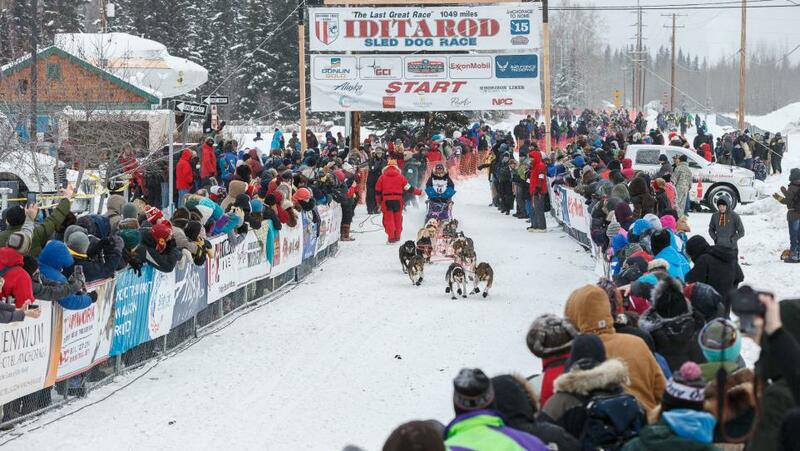 The official start of the Iditarod is just one of many reasons to "Explore Fairbanks" as the month of March is teeming with events and activities. Fairbanks is home to the 2017 World Ice Art Championships, the largest ice sculpting competition in the world with more than 70 teams from across the globe participating. Approximately 45,000 visitors come to the Ice Art Park annually to see the intricately carved masterpieces. Sculptors will use over four million pounds of "Arctic Diamond" ice which is exceptionally clear, thick ice harvested from a pond on the property. The 28th Annual World Ice Art Championships run from February 20 through March 26, 2017. The 44th Annual Festival of Native Arts runs from March 2 through 4, 2017. The festival provides a forum for Alaska Native groups to share their cultural heritages. Dance troupes and artisans from Alaskan locations as distant as Hooper Bay, Atmautluak, Juneau, Stevens Village and Shishmaref will join with invited guests from the continental United States, Japan, Australia and Canada for diverse presentations, an arts and crafts show and food booths. Fairbanks “Aurora Season” runs from August 21 to April 21 and March is prime time for aurora viewing. Fairbanks is located under the “Auroral Oval,” a ring-shaped zone over the far north where aurora activity is concentrated. Additionally, low precipitation in Fairbanks contributes to consistently clear nights. All combined, these variables make the Fairbanks region an outstanding destination for possible aurora viewing. Experience the aurora from a heated "aurorium" cabin, on an overnight sled dog trip, by snow cat tour to a panoramic vista, on a flight above the Arctic Circle, or simply walk outside and look up to see the captivating northern lights weave across the night sky. If the aurora appears in the middle of the night, many hotels offer wake-up calls. In addition to the Iditarod, March features a busy dog mushing schedule, which includes the Junior North American Championship Sled Dog Race from March 2 through 4, the Limited North American Championship Sled Dog Race from March 10 through 12, and the 71st Annual Open North American Championship Sled Dog Race from March 17 through 19. Since 1917, those with a betting spirit have wagered when the ice will break up on the Tanana River. Each guess for this year’s Nenana Ice Classic pool cost $2.50. The jackpot totaled $300,000 in 2016. A tripod made of local logs is raised and frozen into the river and attached to a time clock ashore to mark when the ice goes out – it could be as early as late April or it could be late May. Nenana, a small community on the banks of the Tanana River about an hour’s drive south of Fairbanks, is home to the Nenana Ice Classic Tripod Weekend, March 4 through 5. The Morris Thompson Cultural and Visitors Center provides vacancy listings and more information on museums, art galleries, performances and other things to do during a stay in Fairbanks. Also at the center is the current exhibit “Icons of the Iditarod,” featuring official Iditarod photographer Jeff Schultz’s imagery. To learn more about the Iditarod go to www.iditarod.com. For more information on Fairbanks, request a free copy of the Fairbanks Visitors Guide and Winter Guide from Explore Fairbanks at 1-800-327-5774 or (907) 456-5774 or by writing to 101 Dunkel Street, Suite 111, Fairbanks, Alaska 99701. You can also order or view the guides online, get information about the aurora borealis and see a robust schedule of winter events and activities online at www.explorefairbanks.com.